Home / Blog / The rise of silver surfers: Are you online yet? We are seeing a rise in the number of ‘silver surfers’, who are taking full advantage of the internet and using multiple devices in every aspect of their lives. This could be to plan their retirement or browse, shop and bank online. Many are even getting to grips with social media platforms such as Facebook, Twitter and the photo sharing website Instagram. This counters traditional stereotypes, which contrast digital-savvy younger people against older generation technophobes. We have found a wealth of recent research and statistics to evidence this. According to a 2016 study by the Office for National Statistics (ONS), internet use among people in later life is on the increase. Recent internet use in the 65 to 75 age group is up 68.7 per cent since the survey began in 2011, increasing by 7.5 per cent in 2015 alone. Historically adults aged over 75 have consistently shown the lowest rates of internet use. However, in 2016 the percentage of over 75s surfing online nearly doubled from 19.9 per cent in 2011 to 38.7 per cent in 2016, up from 33 per cent in 2015. The proportion of adults aged over 75 who had never used the internet also decreased from 76.1 per cent in 2011 to 56.5 per cent in 2016. Amongst people categorised as retired, the proportion that recently used the internet rose from 39.8 per cent in 2011 to nearly 60 per cent in 2016. Research last year by the digital agency Greenlight revealed that over 55s spent over £14 billion online in 2015 and are expected to make up two thirds of all retail activity by 2025. According to a summary of the research in the Daily Telegraph, 76 per cent of people this age make at least one purchase a month using the internet. Equally the BBA, the UK’s leading trade association for the banking sector, found last year that nearly 2.3 million people aged between 70 and 100 use internet banking. Its study also revealed that more than 450,000 customers over 60 connect to their bank accounts, make transactions and read statements online using apps on mobile devices, such as smartphones and tablets. According to a recent article in the Daily Telegraph, older people are using social media to keep in touch with friends and family, including grandchildren that may live far away, as well as share photographs or videos online. The proportion of people aged 65 or over using social media platforms such as Twitter and Facebook increased in 2015 from 15 per cent to 23 per cent. In the 55-64 year old age group, this figure was more than half. Also, these silver surfers are not just viewing content online. One in five over 65s said they had uploaded their own photographs or videos to share with other people across social media. We recently launched our new website, so we thought it was a good time to look at our own statistics and see how many of our customers are planning their retirement online. Our website is a good barometer as more than two thirds of our visitors are in the over 55 age bracket. The percentage of customer enquiries coming through our website from mobile and tablet has increased massively from just 2.73 per cent in 2011 to a whopping 38.27 per cent in 2016. In addition, we have seen the number of people visiting our website using mobile devices, such as smartphones or tablets, grow significantly. In 2011 they accounted for just 2.89 per cent of our total website traffic. This year that figure has shot up to nearly half of our total website traffic! Over the years we have gradually improved our website’s functionality and appearance. People can search for available properties, find out about our communities and the retirement village lifestyle, get details of our events and read Retirement Villages’ news. We recognise that people in later life are becoming more tech-savvy, so we have exciting plans for our website’s latest iteration – village-specific intranets for our residents. 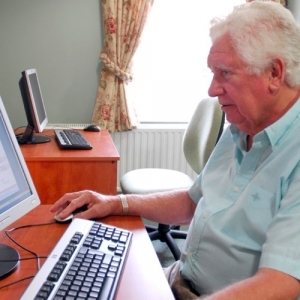 People who live in our retirement villages will be able to log in to these private areas of our website to share information with other residents and / or the village staff. This could be events, groups, activities or internal news. Groups organised by residents such as Elmbridge Village’s monthly computer club, where our own silver surfers come together to share their love affair with all things IT, further evidence growing internet usage among people in later life. Run by chairman Peter Murphy and website co-ordinator Derrick Myers, both residents at Elmbridge, the computer group is extremely popular with over 30 members, 20 of which are women. Topics covered include emails, word processing, editing videos and photos as well as looking up family history online. You can read more on the Elmbridge Computer club, including comments from many of its members on why they love to attend in our article here. This evidence shatters the myth that technology is only for young people. Older generations are just as digitally confident and socially engaged as young people. The silver surfer population is growing quickly and proactively engaging with the internet and social media. If you are just starting out and are looking for a little guidance then check out Age UK, which offers a variety of courses geared around making the most out of the internet, staying safe online and operating computers.